The Long Road to China: Black and White Wednesday - "A Brother Is..."
Black and White Wednesday - "A Brother Is..."
After 5 weeks, we finally have an official "Black and White Wednesday" button! Feel free to go to my sidebar and grab the new button! Today's photo....or I should say, the first photo, was one of my favorite shots from this past weekend. I purposely didn't post it on Monday and saved it for today. I was not a big fan of the color version, but when I saw it in black and white......I couldn't wipe the smile off of my face. As I have said many times before..... these two are like any other brother and sister duo. There are days where I feel like I need to be wearing a black and white striped shirt and have a whistle around my neck....... but we also have days where they are so sweet and loving with each other. Our little afternoon in the park....was one of those days that was filled with so many of those sweet exchanges.......I am just so happy I was there with camera in hand to capture them. This one was posted in full color the other day, but I couldn't help but convert it....and now that I see it, I personally prefer the B&W version. So let me fill you in on a little obsession that I have........ I need to put things in groups of THREE. When I buy or arrange things in my home, I like to cluster in groups of three. I actually think there might be some design rule about it.... not sure, but for some reason it has always stuck with me. After I decided on my photos for this week, I came across the "A Brother Is..." poem and thought it was absolutely perfect for this series. In sticking with my "Three Theory" I am going to print and frame the poem in between these two pictures. I have to admit, I was pretty excited to get a few usable pics of the kids together. So many of my photos are of the kids individually.....and that is something that bugs me. So this is yet another goal I am setting for myself as part of this project. More photos of the kids together. Speaking of goals...... I bet you thought you might see a pic of my wall?? Sorry, no can do. I am so far behind..... none of them are up yet!! I need to get my rear in gear....the black and whites are piling up. Alright.... now it is your turn. sweet. im the first to comment this week. i love your black and white wed once again. Yes i agree i love the black and white version.. but the full color is still lovely. enjoy the rest of the week and hope to catch up soon. Wonderful pictures and a lovely "Brother" poem... Thank you so much for this challenge - I love it! im trying to add my link... its being orkward. i'll try again in the am. Mister Linky does not seem to be working?? I love the poem and the pictures are amazing. I have a boy and a girl with ages similar to yours...They either adore each other or are fighting like crazy! I am working late and couldn't help to post. Beautiful pictures as always. Your kids are so beautiful. Hope you are doing well. I want to come live where you live. You find the most spectacular places to take pictures. I am going to make it a mission to find at least one scenic location that can compare to some of yours. Hmmmm...that might take a while! Beautiful pictures and beautiful children. I love the button and it inserted easily in WordPress. Have a wonderful Wednesday - I have come to look forward to them more with B & W Wed. Thank you! I love your photographs - particularly your black and whites. I don't comment often, but I really loved the photos that you posted on Monday too. You have beautiful subjects. Such wonderful photos of both of your kiddos. And I absolutely LOVE the poem too! Perfect. I have a thing about 3's as well when decorating my house. I too think there is a design rule about it. Hmmm....might have to google that, ha ha. Oh Lisa, you're right. that first shot is crazy beautiful. I love the feeling of it, the path, brother looking back, but down at his siter, and sister grabbing the camera with her beautiful eyes. It's perfect! Me too. I do everything in threes (except kids....that option has expired!). I always have. And there is a design rule - 3's or 5's work in design, flower arrangement, music etc. Love the poem and your new button......great. I'll go and copy it now. 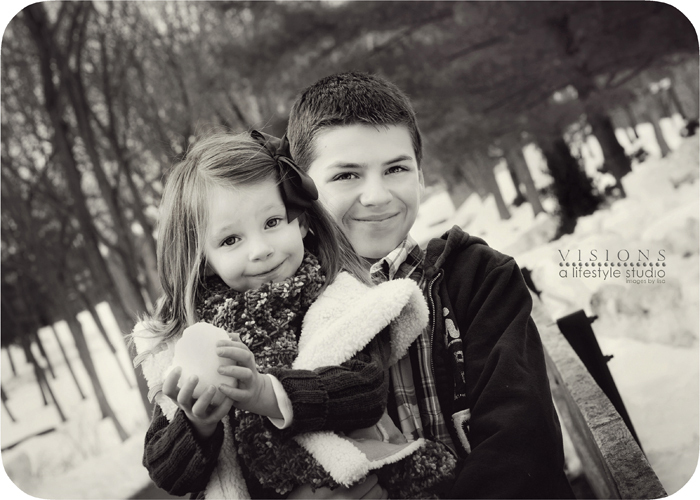 Oh my goodness Lisa, what fabulous photos of your scrumptious kiddos! See, you'd have had me fooled that these two don't get along all the time...they certainly look like they are very fond of each other. I do know what you mean about wearing a striped shirt and carrying a whistle sometimes. Although my two adore each other, they do get on each other's nerves from time to time! I love the poem, it's so sweet. My girls want a baby brother soooo bad and I would love to have a son. We'll see what God has in store for us! LOVE the new button!! Thanks for doing this - it is my third week, but I have really enjoyed it and I so love black and whites!! Your family is beautiful and I can't wait to stay tuned for the newest addition!! I also would love to possibly take an on-line course with you, but the school year is so hectic right now...don't know if you have any plans for over the summer. First Off ~ Give a Shout Out To Marla for the Button! I already added it to my posts! Great Job!!! Love the photo of brother and sister in black and white. They are adorable. The poem is just perfect. You are correct, there is a design rule behind groups of 3s which applies to many groupings of odd numbers. Sweet! Love the B&Ws of those two together! You are doing a fabulous job here! I'll grab your button to stick in my post. It is lovely. What a lovely poem and beutiful pics! i am really enjoying this blog meme Lisa! I have visited so many awesome blogs because of it - thank you! Loving your captures today - gorgeous in bnw. You children are too precious for words. BTW - I did get the emails - just haven't stepped up to the computer until now. Lisa I have a stack of pictures to frame (color and B&W)...but I know it's going to cost me a bundle so I'm avoiding it LOL they don't look very good stacked in my closet LOL oh one day...I say that about everything LOL makes me feel better. Love the b&w conversion! When you get your wall done and pictures hung, I can only hope that you will post pictures of the final product...based on your posts, I'm sure it is going to be one beautiful and amazing wall. Your pictures are always incredible...They are always beautiful and peacful looking...I just love them! I also want to thank you for saying sometimes you feel like a Referee...I needed that! Awwwwwwwwwwwwwwww! She is so precious! I am glad she has a wonderful brother in Nick! These pictures are so perfect and just beautiful! You can tell what a special relationship they have with each other in these photos. Too sweet! Your button is on my blog! Love it! Gorgeous pictures, fantastic poem, and a wonderful plan to display them. These pictures really make me miss my baby brother. What joy it must bring you knowing Nick and Sarah are close. Love the button, love the picture and the poem! I love those days when seeing your children together just melt your heart. Have a great Wednesday! I love how you added these b&w's into your banner. The sibling love that is expressed in those photos is so sweet. Have a great day! I'll get my post up soon! Absolutely love the pics and the new button...how fun!! Thanks for doing this each Wednesday; it is a lot of fun! Loving the B & W banner. A really sweet post and pictures to along with it. Thanks for the reminder. 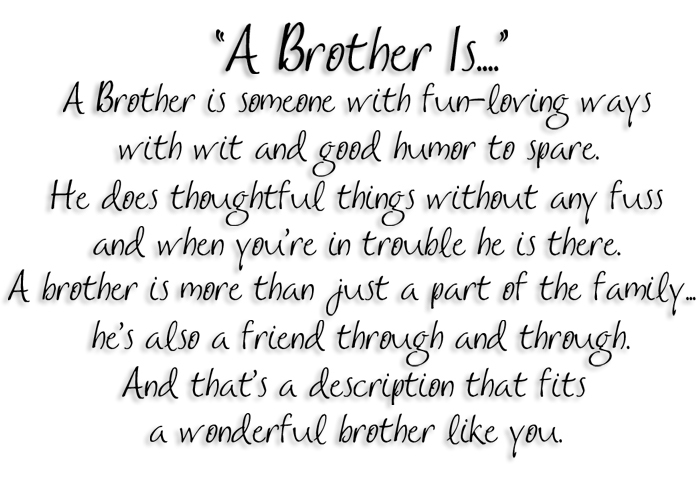 I have TWO brothers. And, I have a three obsession also! Lisa..your photos are simply works of art..they are just so beautiful to look at...over and over again.. I've just discovered you and this B&W meme via Cop Mama. I must say I was very impressed by your post! Your photos are gorgeous and I LOVED the poem. It sits very well with your photos! I'm now following you, and have taken your badge, so that I can participate in this meme. Lisa, I LOVE the first one, it's one of my very favorites that you've ever taken of your 2. You really see the relationship between them. And the poem is beautiful. Well I'm a 3 person also, there's a design rule about odd numbers actually. Oh, I love that top photo. It's perfect! Especially since they've been traveling this long road with you. And what a great poem to put in between these two photos. Your wall is going to look so good!! I've been experiencing similar days where my two are actually enjoying being sister and brother. I never thought it would be this difficult, but the wait was well worth it. Saturday night Liam went out with his daddy and Natalie actually looked at me with these sad eyes and said "I miss Liam.". The best three words I've heard in a long time. Happy Wednesday to you my friend! I used an outdoor photo also today - yours is perfect! The new button is perfect too! Maybe this should be "Perfect Wednesday"! Lisa - I love love love these. I always thought I would have 3 boys, but if I didn't - always thought I would have a boy first as I wanted any daughter to have a Big Brother. I love my older brothers so much - and wanted my daughter to have that same experience. Little Sarah is so lucky to have Nick. I goofed and somehow my last weeks post was linked, so you can delete #40. My new link is #43. Sorry! Don't know how you do it, Lisa. Every single picture is inspiring. I just love the BW versions of these images...really special. Great idea framing the poem between the two. Your obsession with THREE, huh? Hmmmm, no wonder there are THREE children in your future! Oh, boy, there's gonna be a lot of catching up to do on that wall when your baby daughter gets home! P.S. LOVE the new pictures in your header they fit perfectly! P.S.S. I miss our lunches too...better hurry and get back here...I'm having withdrawals! This is my first time visiting by way of Life with Kaishon. What a great meme! I love B&W photos and yours are gorgeous. BTW...I love that you call yourself half Gaelic/half Garlic. That's awesome! I had never heard that expression before! Well these are some great images!! I love them and the poem is fabulous! Love this part "There are days where I feel like I need to be wearing a black and white striped shirt and have a whistle around my neck....... but we also have days where they are so sweet and loving with each other." I simply adore your photos! Beautiful pics! I am loving watching Jacob and Jennifer bond. There is already this huge sense of pride coming from Jacob towards her. It is so special! Love the button! It's on my blog and so is my entry for today. Thanks for doing this...I LOVE black and white photos!!! These are wonderful photos of your children. Very sweet. Thanks for hosting B&W Wednesdays! Lisa, I adore your work! Happy Wednesday! Love the poem & I really like the B&W conversions. I never would have thought that I would like them as much as the color version ... but I do! I hope you showed this to Nick! I also love the B&W portrait of them... the color was beautiful, but you just zone right in on their faces here. Your photography just blows me away. I wish I lived closer, I'd so be in on those workshops you mentioned in a previous post! I need help in that department! i love these sweet photos! he looks like such a sweet brother! it's sweet to think about he'll always be there for her! especially when they're teenagers! WOW. Your children are gorgeous and your ability to capture them is breathtaking. Honestly, these are stunning. I hope that you put that last one in a prominent place on a wall somewhere, because it deserves everyone's full attention! Beautiful photos, girl! I LOVE, LOVE, LOVE the first one!!! It is hands down, my all time favorite of yours. Seriously! OMG! I wish I could participate this week, but life has been entirely too hectic. Plus, it is so darn cold I don't want to take my camera out. Hopefully, I will get better. I have two shoots this weekend, so I am bound to have something to post next Wed.
Love the new header! The black and whites are gorgeous, and so beautiful of them together! I so have to make that a goal of mine with the girls too! I think I may venture out in the snow with them on the weekend if I'm able to hold the camera yet! Happy Wednesday! lovely! and i think you're right about the design rule...i've always been told that things should be arranged in odd numbers. Gorgeous! I can't believe what an amazing photographer you've become! Your kids are so fortunate that you have such talent! And the poem - too sweet! Okay, once again I'm horribly late. I didn't even know if I had anything to share this morning then my daughter showed up in her Chinese dress for the CNY parade (that I didn't even know about!) and I couldn't resist pulling out the camera. If only this happened yesterday! Over the weekend, I posted a photo of my girls with their big brother. He wasn't always very supportive of their adoption so it makes my heart sing to see all three of my kids sharing a special moment. Amazing photos and post!! Love it! I love these pictures. How many did you take that day? I know my friend will fire off at least 200 sometimes and then keep maybe 75. Such beautiful pictures as always! I'm going to e-mail you about your photoshop class. I would love to sign up! Seriously... I just LOVE, LOVE, LOVE, LOVE, LOVE your photography!!! I SO want to take your new online classes one day! Great work...AGAIN!! And I love the button, too. Can't wait to see your B&W wall as it unfolds. I know it'll be stunning!! It is a decorating rule to group things in odd numbers, visually more stimulating. You have an eye for what looks good and I bet you knew that naturally. Your son looks like an awesome big brother, I always wanted an older brother, not pesy younger ones. Here's my e-mail address if there's room for another for the photoshop class. I saw this blog hop a few weeks ago and wanted to join in but keep forgetting. Next week for sure!! great shots, I love black and white shots! I just had to comment because I am the same way with the rule of three in my home!!! My mom is a fantastic decorator and the rule I think that you are thinking of is one she always taught me "Never decorate in even numbers" which I think must be where I get the rule of three thing from! So funny that you do the same! Anyways- you take wonderful pics and have two adorable children and I love peeking in from time to time to see what beautiful snapshot you have posted!! Thanks for sharing! Good luck with your china adoption as well. I am just considering getting into the process myself which is how I stumbled upon your blog! Photography is dependant on the reaction of the chemicals on the film to light, it is easy to deduce the importance of light conditions when taking photographs. As light is as important as indicated, one must also be aware that light can be reflected off certain objects, it can be absorbed by others. Lisa, I just love these images. What a great big brother, Nick is. They are fantastic in black and white!! OK. I just have to ask...is he really as sweet with her as he seems? I've always thought your son looked like such a nice and loving brother to her. She's lucky! Lisa, I agree with you that the last one (the snowball) is nicer in black and white. Somehow, the absence of other colours takes away distraction from the love between these two. It also focused me on the snowball S is holding. Gorgeous photo's!!! I totally know what you mean about having those days when you feel like you have to be a referee...I'm one today! And then when you get those awesome days when they get along, life is so good! I'm due for one of those days soon...I hope! lol!! Happy Friday my friend! Enjoy! Wow, how I love your Black & White Wednesdays. I really need to stop doing the "wordless" ones and start the B/W instead. I love B/W, and you capture so much so well. Thanks for the inspiration! Such AMAZING pictures!!! Your babies really DO pop off of the page! I also love your button - hope I can get motivated to break the camera out again :( Even if my pictures aren't as amazing as yours!! 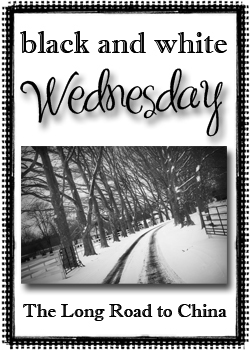 Black and White Wednesday - "The Long Road"
Black and White Wednesday - "Rose"